ANDRITZ will be presenting its range of separation technologies and services for powder and bulk solids and its automation solutions at the POWTECH fair in Nuremberg from 9-11 April. One of the company’s latest technologies is its pneumatic discharge system for Krauss-Maffei peeler centrifuges, which eliminates the need for gravity discharge. Krauss-Maffei peeler centrifuges are batch-operated filtration centrifuges that are known for reliable performance at high capacities. 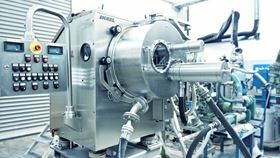 With the pneumatic discharge solution, a peeled product is transported out of the centrifuge, immediately removing product particles and dust. The company says this results in increased yield with a high filtration performance, a decrease in product losses, and minimal maintenance. Visitors will have the opportunity to explore a full-size PUREVO pharma peeler centrifuge fitted with this new pneumatic discharge system and learn about its benefits when applied in bulk chemicals, fine chemicals, and many other applications. Andritz will also showcase its Metris addIQ control system, which enables customers to analyse and optimise industrial production processes. In addition, visitors can find out about Industry 4.0 solutions for food production and hear about an intelligent filter press in a presentation by an Andritz specialist. The Andritz team will be in Hall 3, Booth 313.